Above is the picture of scratch built model number 30 for my ACW naval project - the CSS Louisiana. She comes in at 3 1/2" long which is the maximum size I can really go to if I want to keep the model on a single Hexon tile. The ship was constructed using my tried and tested casemate ironclad building technique and the only difference was with the structure on the top of the casemate itself. Historically the ship had two tandem centre wheels (the two curved structures to see to the rear of the funnel) and a pair of screws. the wheels did not work out as they got in each others way and so she was towed into position as the screws were non-operational. She mounted 16 guns but the broadsides had the five gunports you see on the model in a line whilst the other side had them grouped as a three and a two - see the following diagram for details. I have represented this but not the ports that have plated over. The wheel housing and funnel were surrounded by an armoured breastwork designed as protection from sharpshooters and I have reflected this on the model as well. I am quite pleased with this model as it now means that I have only six more to go before the first batch are completed and I can start painting. The CSS Mississippi is also at the fitting out stage and I am hoping to finish her tomorrow evening before tackling the remaining three Confederate cotton clad gunboats which will in turn set me up nicely for the grand finale of the USS Tuscumbia and the USS Chilicothe. Well not exactly, but I thought I had best mention the state of play in respect of my river based ACW scratch built collection. CSS Louisiana and Mississippi are now at the fitting out stage of funnels, hatches, pilot houses and gun ports. The Louisiana is in fact merely needing the 16 gunports to be ready so they are both very close to completion. Of the two ships I would say that I am on firmer ground with the Louisiana in respect of what she actually looked like - the Mississippi is very much a best guess although the design was later used for the CSS/USS Atlanta (yes, she was another ship that served 'under two flags') so that gives us a clue as to how she was configured. The picture above is of the Atlanta - the Mississippi has a lot more artillery (20 guns in fact!) with 3 guns facing forward and aft and 14 on the broadside (7 a side). She also has two funnels mounted in tandem. I hope to have these two finished over the next few days and will then tackle the 3 cotton clad gunboats prior to the grand construction finale of the USS Tuscumbia and USS Chilicothe. Why, oh why do we do this? Rye is a lovely old town - full of of small shops without a supermarket to stifle the local businesses. We stopped for a small lunch at a tearoom called Poppys and thus refuelled went for a wander. Rye is built on what can best be described as a smaller version of Ayres Rock in Australia in that it all appears to be built upwards - which is hardly surprising given that it used to be a port although the sea has long since receded. The top end of the town is very 'old English village' pretty - with lots of timber framed buildings and cobbled streets, complete with Narnia-esque street lamps. The Ypres Tower approached from the town side. We headed up to the Ypres tower which was built in 1249 and has over the years been used as a police station, a prison and the local mortuary. It was the only major building left standing in Rye during a major French raid in 1377. This speeded the building of the defences and so when the French tried again in 1449 they were easily held off. The town wall was allowed to fall into disrepair although some parts are still visible. Only a single gate remains - the Landgate - from this period. Ypres Tower was named after Jean d'Ypres who owned it for sometime between 1439 and 1452. It is quite small but with some great views and also has an Elizabethan walled garden added to the side . The whole place overlooks what was the coastline and just below the tower if Gun garden where some Napoleonic era artillery was mounted. The Elizabethan Garden viewed from the battlements of the Ypres Tower. After a very pleasant afternoon (which included searching for a suitable eating house for the evening meal) we to our guest house located just outside Rye in order to refresh ourselves and to prepare the evening. We headed into town and dined at a pub called the Standard which was absolutely first class in respect of the quality of food and service. Walking back to the car through the old town at night was quite eerie and evocative of days gone by - especially around the old part of the town with its cobbles and timber framed buildings. Our guest house was an old farmhouse just outside of town on the road to Peasmarsh and it is a lovely peaceful place to stay with some fantastic views and a breakfast that will last you until the evening! Sadly I missed the Rye Scallop festival (it was the week before!) but the quality of the local food and beer was a more than adequate compensation. Whenever I go to a piece of old England I always come over all 'English Heritage' and start thinking about the great shame that my wargaming interests do not include such things as the English Civil War, or of any of the numerous medieval conflicts or even the smuggling option - small numbers of figures and ideal for a skirmish game. It was a lovely relaxing couple of days and although nothing tangible resulted in respect of any purchases for my hobby I nevertheless came away inspired, albeit in a small way. The order cards for the game really capture the feel of the era and the use of a block based system for resolving combat rather than having units fight at full strength until they are destroyed works well but does take a little getting used to after Battle Cry and Memoir 44. The effect of stationary infantry being more effective than moving is nicely captured and the effectiveness of light troops is handled well although I suspect that this area of the rules will be subject to some debate. The rules for infantry squares seemed to work well - an infantry square parked on a hill with enemy cavalry hovering close by and under attack by two enemy foot units should really not expect to be around for long and this was indeed the case. Inevitably after reading the rules after the game I have realised that a few things were not handled correctly but will obviously be taken under consideration for the next outing which I hope will not be too long in coming. I want to use the blocks on my Hexon terrain on a 3d basis and believe that this will look good - even to the extent of deploying the blocks in formations as the game board hexes are too small to be able to do this. All in all it was very good first run out and my thanks once again to Mr Fox for the game and the object lesson in how not to attack an enemy parked on a hill line! Today also sees my 400th post and as ever, I am truly thankful to everybody for their comments and observations, hints and ideas and continued support for my efforts. It is no exaggeration to say that without these contributions and unstinting support many of my projects would still be languishing on the back burner and so I thank you all for taking the time out to keep me ticking over! Here's to the next 400!! C and C Napoleonics this evening at the club and I am really looking forward to trying the game out and will report the results in due course. Why the 35 minute ironclad? Very simple really, as that is exactly how long it took me to build this model of the CSS Manassas - formerly the icebreaker Enoch Train. The hull was shaped from a single piece of Balsa wood with the inevitable plastic trimmings and she comes in at around 1 3/4" long so is the smallest of all the models I have thus far built. I think she sits a little taller than she should but that was a conscious descision on my part and I have done this with the whole collection, primarily for visual impact. I also marked out the hulls for the CSS Louisiana and Mississippi - these will be 3 1/2" long and is the limit I can go to if I want to keep a ship within a single Hexon tile - and will begin construction in earnest on these two ships this evening. I spent the free time I had this weekend finishing the block labelling exercise for the Command and Colours Napoleonic game I recently acquired. They are now all finished and I hope to post some pictures etc in due course. It was quite a tedious and time consuming process but worth it in the end the blocks look very nice indeed. I am planning to have a first game of this on Wednesday evening at the club and again, will report how this plays out. One experiment I will try at some point is to use the blocks on my Hexon terrain - it will mean 3d games and there is sufficient space within a terrain tile to be able to deploy the blocks in actual formations (line, column or square) which will add to the look of the thing no end. As I (currently) do not own any Napoleonic figures (except for a Napoleonic Ottoman Turkish force) this will be viable alternative. I will also be able to make use of the 'Town in a Bag' buildings. More to follow with this one as it develops. The Final Countdown....8 more to go! CSS Louisiana, CSS Mississippi, CSS Manassas, USS Tuscumbia, USS Chilicothe and three Cottonclad Confederate side wheel gunboats. The first two ships are huge and only the Louisiana fired her guns in anger, albeit as a floating battery. The Mississippi was a huge ironclad that was destroyed to prevent her being captured and she was barely half complete when this happened. The reason I am making these two ships is simply because for the theatre of operations I shall be covering they would be essential. The two big Confederate ships exerted a huge effect on Union planning for the area - a threat that never materialised (I am reminded of the WW2 Tirpitz in a way!) but cannot be ignored. Allowing their use on a 'what if' basis is part of the bread and butter of our hobby and besides, the resultant models will look very intimidating as well as offsetting the Union quantitative and qualitative advantage. When I started out on the ACW ship project I had several goals in mind. I wanted to construct a pair of representative fleets for operations along the 'Great Father of Waters' i.e. the Mississippi. the models were to be scratch built and scaled to fit on a single Hexon terrain tile. the models are to be based, with a name label and a national ensign placed upon the card I shall be using. The models themselves were to be constructed using balsa wood and the copious supply of craft sticks, coffee stirrers and modelling match sticks I have stockpiled. I would not be going for scale model detail - these ships were to be first and foremost gaming pieces that happened to be a close approximation to their historical equivalent (or at least what we know of them!). I am confident I have achieved this although I feel that I should acknowledge the shortcuts and deficiencies in the construction of the models I have built - if only because I am well aware of them! None of my models follow any attempt at scaling - although I have tried to ensure that relative size differences can be seen. Angles of armour etc has been based purely on what I can easily work with so that means 45 degrees - for everything! Funnels are too thick and too short. Gun ports are one size and design regardless of what they actually looked that - again for convenience. There are no masts or ships boats present. Much fine detail has been left off - anchors, ladders and such like. Pilot houses are usually the wrong shape and in the wrong place. Paddle boxes are all one size - again this is for convenience. Many ships had 'flaring' to merge the paddle box into the line of the hull - I have not bothered - mainly for convenience. There are probably a lot more points I could add but that will be sufficient for the purposes of this post. The simple fact is that I have made these models in a basic fashion for ease and convenience (not to mention cost!). They are gaming pieces pure and simple and as such are purely representational and not examples of the fine scale modellers art. Ellet Rams steaming in a loose formation preparing to engage the Rebels. Huzzah!! The latest batch of seven models for the ACW naval project have been completed (well built anyway). 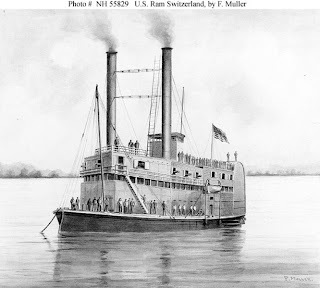 The first picture of four ships is my interpretation of a typical side wheel steamer as used as the basis for the ships of the Ellet Ram Fleet. I had already made three of these and the newest addition is in the bottom right of the picture - I just wanted to see how they looked en masse. USS Switzerland and USS Lancaster on patrol. The next pair are my interpretation of the USS Switzerland and the USS Lancaster. These two ships appear to have had an extra deck added hence the extra height. Note the use of the cut plastic angle from the Mega Blok building brick I have used to endure that the angles at the front of the superstructure are constant. there should be more gun ports along the side as well as a 'flaring' from the paddle boxes but I have not bothered with this! The Queen of the West times two! The next pair of models are my two copies of the steamer The Queen of the West. I have made two copies of her simply because she, like the General Price in my earlier post, served in both navies. Like most of the ships of this era, there are a number of different interpretations of exactly what she looked like so this is a reasonable compromise. Again, you can see the plastic former I used for the front of the superstructure. The USS Vindicator (what an inspiring name! )was a sidewheel ram and featured in the pursuit of the final model from this batch - the enigmatic CSS Webb. The CSS Webb preparing for her epic flight from the Yankees. The final model from this batch is the CSS Webb. She was a very mysterious ship (as well as one of the longest surviving ships the Confederates possessed) and the only illustration of her I have been able to find was a line drawing from the civil war era newspaper Harper's Weekly that shows her in flames after having been set fire to by her crew. The only details I could make out for certain was that she had an angled superstructure at the front with a single gun port as well as a single funnel - the rest is pure speculation. One thing in her favour though was that she was fast and had fairly good engines which was rare for most of the Confederate navy! These have taken longer than I expected simply because of the lack of time I have had due to work but having said that, I am quite pleased with the way they have turned out. The variety of side wheelers is self evident and so in order to complete the full spectrum of river water craft I would really like to try my hand at some stern wheelers....but not just yet! I am now clear for the weekend and so can concentrate of the labels for my C and C Napoleonics. A little more progress to report on the latest batch of models - I have been able to add the pilot houses and hatch covers so all that remains are the funnels and in the case of 4 out of the 7 models the addition of some gun ports. They are looking good and although are all side wheelers they are sufficiently different looking in superstructure or layout to add variety to the collection. For reasons I will explain later I have also been having another rethink about the Confederate casemate ironclads. All in all then, in spite of having very limited time this week I am feeling very satisfied with my progress thus far and it sets me up nicely for a weekend of label sticking for my copy of C and C Napoleonics. A Herculean Effort - With More to Come! Despite the later than expected arrival home last night (as well the distracting prospect of the second half of the Arsenal vs Barcelona game) and by virtue of a really intense effort I was able to not only assemble the 14 paddle boxes for the latest batch of ACW models but also to fix these to the hulls so all 7 models are now at the fitting out stage. My usual late night home from work yesterday meant that I had little time for model making although I was able to finish the last superstructure of the current batch of 7 side wheel rams/gunboats. I also managed to cut out the facing for 14 paddle boxes - using the curved ends of the legendary craft sticks. My paddle boxes use this harder wood as a former with the softer balsa wood being glued to the craft stick and then filed to shape. I tend to use harder wood on most of the vertical surfaces of my models simply because it handles far better than balsa wood and is not prone to denting or otherwise marking of the surface. Again, time permitting this evening (I will be on an extra late one from work tonight) I will finish the said paddle boxes which will leave me on course to finish the models by the close of play on Sunday. I am also very close to having the first draft of the play test version of my hex based rules ready for use - I merely need to finish the ship specifications for the models I have in my collection thus far. All in all then, progress is being made, albeit gradually. One of the challenges I have faced with the current batch of models is the fact that the front of the superstructure on some of them is 'V' shaped with the apex of the 'V' in line with the bow. You would think that cutting such a shape would be easy and I am quite sure that to many modellers it is probably routine fare. Try as I might, I could get the angles right and I always ended up filing one side more than the other and so the result was never even. In exasperation I finally hit upon a solution that has given me a little more work but at least ensures that the angles are constant. Basically, I cut a Mega Blok building brick (the 8 stud variety) into two halves and then cut from corner to the diagonally opposite one, leaving me with a triangular 1/4 brick. I then then trim the top of the brick so that I am left with a perfectly right angled piece of plastic roughly 15mm either side of the apex. I then use this to face a piece of balsa wood of the appropriate size. Simple but effective and you will see what I mean when the photos of the completed models are posted. The Mega Blok bricks are really useful and I acquired a bag of then at a boot sale a few years back. The plastic is far better than Lego for chopping about and of course has the big advantage of being consistent in their angles rather than the hamfisted attempts by yours truly who seems to have real difficulty these days in cutting anything in a straight line! The picture above is of the Ellet Ram USS Switzerland which, with her 'sister' ship USS Lancaster are currently on the construction table together with a further Ellet Ram, two copies of the Queen of the West (both sides used her, rather like the General Price), USS Vindicator and the CSS Webb for 7 models in all - all being side wheel rams. I hope to have all these finished in the next day or so - SWMBO's birthday festivities permitting! This particular ship was what I would call a 'double decker' steamer in that she had an extra deck which gives her that rather imposing profile. Quite what all the artillery on the top deck would do the vessel's stability is anyone's guess! The model has presented a couple of challenges which I will describe when they are finished in the inevitable photo shoot - nothing major, merely an exercise in right angles. This was a piece of pure indulgence: because it was there! I received an email this morning from the Wargames Vault http://www.wargamevault.com/product_info.php?products_id=88110 and this was at the top of the list. I am as weak willed as the next wargamer and so, after a nano-second of lofty contemplation, the £ equivalent of US$ 7.99 was rapidly winging its way across the Atlantic and, as is the usual way with such purchases, the PDF duly arrived in very short order. The production vales look very nice although I was a little surprised to see the name of the USS Tuscumbia spelt incorrectly and the models used for the ship cards (based on the gorgeous 1/600th Thoroughbred Miniatures)of the Ellet rams were almost like seeing a class of ships - they were all the same! The best of my research has shown that at least the USS Lancaster and the USS Switzerland were sufficiently different looking to warrant a separate model. These two ships are on my construction list and you can be certain that they will look different to the rest of the ram fleet for sure! I cannot comment on the rules themselves as, to be honest, I only purchased them for the ideas contained therein and to see if there were any concepts I could easily adapt for my own purposes. They appear to be a little too detailed for my use (the whole file is 51 pages including turning circles etc) but are a sterling piece of work nevertheless. On this very subject (rules that is) I can happily state that my own ACW river based naval rules are very close to being ready to play test and will of course be made available to anybody that would like to see a set. And so it was. I had planned to complete the first batch of 24 models in the ACW naval collection and then paint them prior to building the last group of vessels. After a weekend of consideration this idea has now gone out of the window. I have drawn up a list of the models are want to build in order to complete the project and it involves only another 15 ships. This sounds a lot but when you consider that most of these are variations of those that I have built thus far you can see the sense behind the decision. At the time of writing I have a further 6 side wheel steamers under construction - soon to be 8 when I have cut the hulls out - that lend themselves to production line building. These are four groups of two so will differ from what I have built already and will enhance the collection no end. Finishing the remaining models makes better sense in my opinion if only because it means that the painting can then be tackled in batches of similar vessels e.g. all the casemates, all the rams etc. I have only two large vessels to build for the Union - USS Tuscumbia and USS Chilicothe - and another pair of casemate ironclads for the Confederates so the rest of the numbers are made up of rams and gunboats of various types. I have also, in the meantime, made a lot of progress with the rules I shall be using which, although designed as a fast play set, feature a level of detail I do not usually employ for my naval rules. Pictured above are the twentieth and twenty first models for my ACW scratch building project - the CSS Baltic (on the left) and the USS Essex (on the right). For the size of paddle boxes the casemate should have been longer and narrower (according to Gibbon's Warships and Naval Battles of the Civil War) but the only pictures I have been able to find of her were line drawings from Harpers's Weekly and she looks very 'boxy' and hunched up in profile so I guess this is a reasonable compromise. She was quite straightforward to build aside from the rectangular paddle box housing added on to the standard sloped casemate - even then it was more a case of time rather than difficulty. USS Essex presented a challenge in the shape of the rear end of the casemate which was curved, rather like the end of a bath. I had numerous ideas on how best to make this but opted for using a single piece of balsa and carving it out. This was surprisingly easy to do but it did take a while and of course, needed care. Her distinctive circular pilot house originated from the top of a two stud 'Mega Blok' building brick and although a little small does convey the look of the original rather well. Essex will be joining her squadron mates comprising the four Cairo class gunboats and the Benton to form two sub divisions of three vessels each - historically it was often Benton with a pair of Cairos and the Essex with a pair. With the completion of these two models I am now only three ships away from the 24 vessel threshold and planned at that point to take a break from the construction process and get down to some serious brush work. I am leaning away from this now as I only have a further 15 models to build in total (I am not including coal barges, mortar rafts and some very small gunboats in the total) and would really like to maintain the momentum. Some of the forthcoming attractions are similar to what I have built thus far so painting the whole batch of, say, casemate ironclads, makes a degree of sense. With this is mind then, I am going to compete the 'big build' first before I get any painting tackled. I am however, well advanced with the rules and in any event, am now looking to begin the paintwork at the end of the month. ....And now for something not-so-completely different! I am a huge fan and owner of some of some of Richard Borg's Command and Colours series of games including Battle Cry (ACW) and Memoir '44 (WW2) and so when GMT Games decided to release a Napoleonic version as a follow up to their highly successful Ancients series (which is next on the shopping list!) the temptation was pretty much more than mortal man could reasonably endure. I purchased a copy and boy was I pleased to do so! By way of an explanation I should point out that Napoleonics were my first gaming 'love' as I cut my wargaming teeth on them back in the early 1970's with great hordes of Airfix 20mm plastic figures (including many conversions) used, inevitably, for the 1815 campaign. Aside from the British I owned at one time an 1812 Russian army of Hinchcliffe metal figures but as time passed and other periods of history came and went my interest in gaming the era withered. Despite keeping a small quantity of books (primarily for 1815) and a brief flirtation with 15mm figures about 10years ago, I have not actively played the period for some time. I own a couple of very good boardgames covering both the 1815 campaign and the Battle of Waterloo and have been content to use them but I have missed the tactical side. My immediate problem is that I have absolutely no desire to paint armies for the period - in any scale - so my gaming hankerings have been few and far between. Not any more. The game primarily covers the Peninsula (although I was pleasantly surprised to see a couple of 1815 scenarios included) although does not include the Spanish - these have made the cut for the first expansion (ho hum....). The components are absolutely first class - even the box is reassuringly heavy - and the wooden blocks used to represent the units look splendid when the unit stickers have been applied. The components you can see in the picture above and everything oozes quality. As a frustrated Napoleonic gamer this set represents a wonderful opportunity for me to indulge in my long held passion for the period without a financial outlay the size of the national debt. I am sure that the other powers will follow in due course (I wonder if the Turks will feature at some point?) and so I will happily acquire these armies as and when released. I am hoping to get the labels tackled over the weekend with a view to having my first game in a couple of weeks but one thing is certain: whilst it is a sad farewell to any ideas of acquiring and painting armies for this period (I do have a figure based soul after all! ), as a substitute this game is a more than adequate replacement. I managed to get to Modelzone yesterday lunchtime (the branch closest to my office is in Holborn) and was able to acquire the appropriately sized balsa wood, a replacement saw blade for my trusty X-Acto (this was long overdue as the blade I had been using was over 25 years old!) and some green putty. I was hoping to see if any more of the Zvezda early WW2 Russian Front kit for 'the Art of Tactic' was available but sadly not as yet. I am now in the position of being able to continue the great ACW build-fest and so will resume work on the CSS Baltic and the USS Essex this evening. The USS Vindicator will now have to be put to one side as the spare parts I planned to use for her - specifically the angled superstructure - are in fact too short so will need to be used for something else instead. The sharp intake of breath came about as I reviewed the collection built so far - now at 19 models as I completed the fourth Cairo class gunboat at a little after 5:30am yesterday morning. They are looking pretty impressive (if I say so myself!) and I am really looking forward to building more of them, getting them painted and based and using them in the game or two. I also played my first game of the new edition of Battle Cry last night at the club and it was tremendous fun. The game is subtly different from the original version - the command cards have a few changes to begin with; not to mention the increase in artillery models in a unit and infantry firepower - and plays very smoothly with the all important period feel being enhanced as a result of these 'tweaks'. My thanks to Steve for the game and Mr Fox for organising the action. The scenario was set in Arkansas and the heavily outnumbered gentlemen of the South, under the command of that celebrated bob vivant, wit and raconteur: General Ignatious Gaylord Crook, lost 4 - 2 on the night, although the Union did have four other units down to a single figure each! Great fun and hugely enjoyable. I sat down yesterday evening to tackle the next phase of my ACW ship building program when I made the horrible discovery that I only had a single piece of 1cm square balsa wood 1 ½” long! I use this size as the ‘core’ for all of my casemate based models and the pack of assorted sizes of balsa wood I recently acquired only had a single length in the selection. A visit to Modelzone will now be needed (tomorrow I suspect as I will not have a chance today) in order to get some more in stock. I could laminate some smaller pieces but prefer not to – it is easier just to use a single piece, it makes for a more solid model. This meant that the CSS Baltic had to wait; as did the USS Essex (although I could have started the latter). The single piece of balsa wood I have though is sufficient for the additional Cairo class gunboat I needed so I was able to build the casemate for her with a view to fitting out and finishing the model this evening. Also underway (and not a model I had envisaged building until later) is the USS Vindicator – yet another side wheel ram that looks not unlike the General Price except that the front of her superstructure is angled and her guns are carried internally so some gun ports will be needed. As built she was pretty fast and touched 12 knots. To be honest, the sole reason I am building her is because I have a ready-made superstructure in the spares box and it would be a shame to waste it! That will bring the total of models built up to 20 and I hope to have another couple ready for the weekend – assuming I can get the correctly sized balsa wood in time. If that does not happen then I can easily work on another couple of models instead as I have a number of alternative options I can explore.